The main story on the night was Everton’s excellent performance, but the more significant development in the long-term was Manchester United’s choice of formation and personnel. The arrivals of both Shinji Kagawa and Robin van Persie have seen many questions about precisely how they’ll fit into the side, and while this starting XI doesn’t solve the issue of where van Persie plays, it hints at a change in strategy. I’ve written more about this at ESPN (before this match), but Ferguson has been playing a 4-4-2 / 4-4-1-1 system in the past three seasons or so. Regardless of what you want to call it, it’s generally featured two forwards – Wayne Rooney and one of Dimitar Berbatov, Danny Welbeck or Javier Hernandez. The wide players were deployed as wide midfielders rather than wide forwards. The alternative, a 4-3-3, was generally fielded in a more defensive, cautious setting, with the wide midfielders pushing forward and an extra central midfielder used. Crucially, that extra player was never a true number ten like Kagawa. This formation hints at something different. It will probably be closer to the flexible side Ferguson used before the departures of Carlos Tevez and Cristiano Ronaldo, that often featured three points of attack and plenty of movement. A return to that fluid style was attempted at the start of last season, but the catalyst for that was Tom Cleverley, and when he missed the majority of 2011/12 through injury, Ferguson didn’t have the appropriate tools to play that way. Against Everton, the formation was a 4-2-1-3, with two central midfielders that generally stayed in deep positions alongside each other, a clearly-defined number ten in Shinji Kagawa, and three forwards stretched across the pitch. The use of Welbeck on the flank might indicate that Ferguson sees that position as belonging to a true forward (although he did play wide in a 4-4-1-1 on occasion last season). Certainly, when United approached the final third it was not uncommon to see Kagawa, a creative attacking midfielder, behind the three forwards. That’s similar to the Inter side of 2009/10, which would explain why Ferguson appeared to be looking so closely at the key player in that system, Wesley Sneijder, despite his poor form over the past two years. The system was most interesting when van Persie replaced Welbeck, because it demonstrated the flexibility of the front three. First it seemed Rooney was going to the left, then van Persie moved to that side, then Nani went over there. Van Persie was later seen defending the right flank, then it was Rooney’s turn to move to that side. In short, with the exception of Nani (and his replacement, Ashley Young) not popping up in the centre, the three attacking players played all three positions after van Persie’s introduction. The block of three were interchangeable, but Kagawa’s position was permanent. For now, the shape and system will need more work before it becomes fully functional, but the signs here were more promising than the scoreline suggests. United’s use of the ball in midfield was generally very good – they passed quickly, they got Kagawa involved in the play a great deal, despite the fact he was marshalled by two Everton central midfielders, and Welbeck made good runs from wide positions in behind the defence on at least two occasions to find himself apparently in one-on-one situations, though he was denied by good challenges on both occasions. The system broke down in the penalty box largely because of a particularly poor display from Rooney, who didn’t look 100% fit and didn’t offer anything like the movement required for a lone striker. Kagawa’s performance was encouraging, but often he looked up and Rooney wasn’t in a position to receive a clever pass. Sometimes he came towards play to get the ball, but there was rarely a reverse run into a striking position, and United ended up playing in front of Everton. For example, compare Kagawa’s passes to those of Santi Cazorla – another number ten who made his debut in a 4-2-1-3 this weekend – and there are much fewer forward passes into dangerous positions. That’s not necessarily a reflection of poor play from Kagawa – equally, it demonstrates Rooney’s lack of movement to get on the end of potential passes. United’s problem here was a lack of physicality – not just at the back, but also in midfield. Having a creative number ten in conjunction with three forwards asks a great deal of the two central midfielders; Cleverley got stuck in but is a more creative player than he is a scrapper, while Scholes’ tackling has always been his weak spot, and he handicapped himself with a particularly silly early booking. The return of Carrick to midfield would be a slight improvement but not a solution. United will have to focus upon ball retention to hide their lack of ball-winning ability, though few sides this season will exploit United’s physical weakness as expertly as Everton did here. Brilliant as usual. Also i thought Vidic was poor. Return from injury or decline? Also immense performance by Distin and Jagielka. Very early days to get so tabloid and trigger-happy about Vidic. The guy has been out with long term injury and this is his first competitive game back. I thought Distin did a great job but Rooney was having one of those games he tends to have where he looks utter rubbish, which made the Everton’s centre backs job considerably easier. Disappointed he didn’t get subbed off. He gave nothing for Welbeck and Kagawa to feed off. I thought Kagawa unsettled them to a certain extent but with Nani and Rooney having stinkers, we couldn’t get the best out of it. Spot on about the midfield do not provide much coverage to the back 4, however, seeing anderson in that short few minutes and fletcher, they provide a better alternative to Carrick. But 1 thing that really stood out for me is that with the lack of protection in the middle, the 2 wing backs played quite narrow and did not provide enough support and width. I bet Roy Keane wishes he was 12 years younger. Roy Keane playing todays game would (rightfully) be banned after no more than 5 matches. The man was a complete thug and the game is better off without him. What utter rubbish. You should try to look past the obviously bad tackles (the city player he did, Gareth Southgate stamp etc) and look at his contribution over ten or so years. He was an exceptional midfield player who could influence games at the highest level (Utd in europe, Ireland on the way to the world cup, they wouldn’t have got to japan if it weren’t for Keane during qualifying) there were some bad incidents along the way and its a shame they over-shadow a superb career. First of all,I’d like to be grateful to you for finding an English website talking about football in depth,what it’s not an easy thing to find,so that I can practising my English by reading and commenting.You’ve got a nice website. With reference to the article,I’m in the same point when you say that ManU moved the ball quickly in terms of movement. This is what we should expect of Rooney and Kagawa. Despite that,I didn’t see Cleverley on top form because he didn’t run as explosive as he usually does after passing. Scholes wasn’t at a fast pace. He didn’t advance with the ball,especially in the 2nd half,when he had big space to run with the ball. ManU didn’t success in creating shots. In my opinion,it was due to absence of movements behind centre-backs.Wellbeck drew a succesful diagonal on first half but,appart from that,there wasn’t anyone else. Centre-backs lived happy. Rooney only moved to receive Kagawa’s passes. The left position of Wellbeck didn’t help either. I think he should have played as central striker. 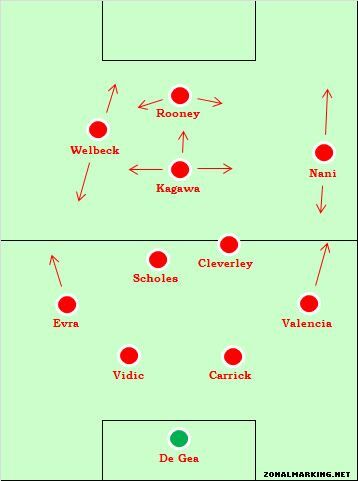 I had expected that Kagawa began on left the plays for going to the center after,with Wellbeck as central striker and Rooney in front of the midfielders. I missed Chicharito anyway. Was he avalaible for the match? He was perfect to attack centre-backs and also to hit crosses in the area. It’s a pity that Van Persie is going to sit him. As for the defense,Carrick was beaten absolutelly by Jelavic,losing concentration to covering him (Valencia didn’t help either),and by above all Fellaini,who was the clear winner of the match. Also,the side-backs didn’t have a decisive rol; they didn’t go up creating superiorities. Yeah it’s definitely worth mentioning that Valencia is by no means a right back. I think people assume that because he does a good job defensively as a right winger, that automatically makes him a good right back. It’s really not like that, he left too much space between himself and Carrick, the most obvious time being when Fellaini hit the post. Baines and Pienaar vs Valencia and Nani was always gonna give United problems without the ball. Brilliant player and all though, I guess he was deployed there ahead of Rafael purely because SAF didn’t wanna leave out someone who’d been so good last year. I agree.Valencia can bear body against body,is fast and is tough. But he must learn concepts of marking (what is not simple at all),measure distances…the only special thing I’ve seen of him playing there is his control+driving under the pressure of an attacker (vs Barcelona in pre-season). Do you know why didn’t Rafael play? Is due to the Olympic Games? Anyway,I’ve got too many doubts of Rafael.Although I’ve seen him more confident attacking and showing his technical skills,I still think he lacks calm in stressful situations appart from making no-sense things. ZM you touched on Valencia being tried at RB in your ESPN article. Do you see more of this taking place? I personally don’t like Valencia being played there. He was one of United’s best players last season and is wasted there. Then again SAF doesn’t like to play Valencia in certain games e.g. Bayern away, Milan away and Man City away. Is Valencia, United’s player of the year last season, not get a look in if United plays 4-2-1-3? I think since the humiliating CL final defeats to Barca Fergie has placed a greater focus on possession. The problem is though that is all it is – posession – and usually at the back. It’s not incisive like Barca so teams (such as everton did last night) are just willing to let United have it. The ball was played far too much from the back to midfield and back again with no one willing to break beyond the ball (although Kagawa looks like he will do this role eventually). Cleverly makes too many sideways passes over 10 yards and needs to learn from a Xavi or Iniesta how to make bursts after his passes to create space. I don’t think Barça is directly incisive in their possessions.Mainly,Barça’s current possession is more planned to defend through the ball,taking from the rival,and waiting for Messi’s power,which is incredible.They often pass the ball between Xavi,the center-backs and the side-backs. I don’t criticize it,quite the opposite,it’s absolutelly effective.What I mean is that ManU doesn’t have to play like this,because there are Rooney,Kagawa and Cleverley,great players who need to move fast continually. Barça’s got a particular system. As well,ManU’s succesful style has been characteristic for its high pace in offensive phases and transitions. Cleverley showed great incision in the early part of last season, when teamed with Anderson but yesterday, he didn’t show it. Maybe he had to be conservative to help out more defensively as he was playing with Scholes, so ended up with both Scholes-Cleverley playing very deep. There definitely was a chasm of space between them two and Kagawa at times. I agree, the movement was well off-key to make the kind of possession United wanted to play effective but its the first game of the season, so hopefully it should get better. It did seem like they were out of sync. Too many times, two players (off the ball) would go to the same area, instead of the duo offering a triangle shape for the man in possession, which was annoying. Rooney was absolutely woeful as a pivot for Kagawa and Welbeck to play off. Paul you’re a genius lol, was just about to post what you’ve said. Absolutely spot on mate! I think the way forward will be Rooney out left in the welbeck position, RVP central and one of Nani/Valencia/Welbeck right. I just hope he doesn’t put Kagawa left and Rooney in his position. Interesting point about Rooney not being on his best form, maybe why Kagawa didn’t run into the box as much(although it was a tough opposition & it was his EPL debut). At Dortmund, Kagawa needed Lewandowski to be on his best form so they could complement each-other on the pitch. Lewandowski would drift wide and make space for Kagawa to run into. Can imagine a similar pattern between Kagawa/Rooney or Van Persie. I agree with you that Kagawa is less of scoring threat himself than he used to be in Dortmund. However, I think I think it has to do more with CB and DMFs’ passing abilities, than his combination w/ CF. In Dortmund, his scoring patterns were mainly 1) Kagawa receiving the ball in small pocket b/ DF and MF, causing opposition a panic, then combining w/ wingers or CF. 2) Wingers or CF gets released on fast counter with through ball, and Kagawa getting on end of crosses. In either case, players behind Kagawa in CBs (Hummels) or DMF(Gundogan, Leitner)needs to be able to thread challenging passes. United’s CBs are not that creative, and Scholes and Cleverly are being bit conservative at the moment imo. So Kagawa is receiving a ball at a timings when oppositions’ defense is ready. In other words, he is being tasked to initiate creative play from deeper position. In Dortmund, other players were able to turn on the switch. Those are good points. Of course Man.Utd can’t entirely replicate Kagawa’s role at Dortmund but hoping to see similar traits in terms of goals scored from ‘late off the ball runs’ and clever positioning in the box. Talking of Gundogan, Cleverly reminds me of him. Not static deep-playmaker, has good ability to drift forward and link-up with the AM. Out of all the attacking players, only Kagawa had a good game. He combined with will with Rooney on occasion, and looked comfortable in the ball in tight spaces, whilst under pressure. Finally, it seems United have a true central creative threat in Kagawa, who will ensure United aren’t too predictable in utilsing the flanks all the time. Overall, I think the system was fine and that it was just poor individual performances which led to a disjointed team effort. On the flanks, United were extremely poor, with most crosses not reaching their intended targets. With Evra, Valencia, Welbeck and Nani providing the width, more was expected. 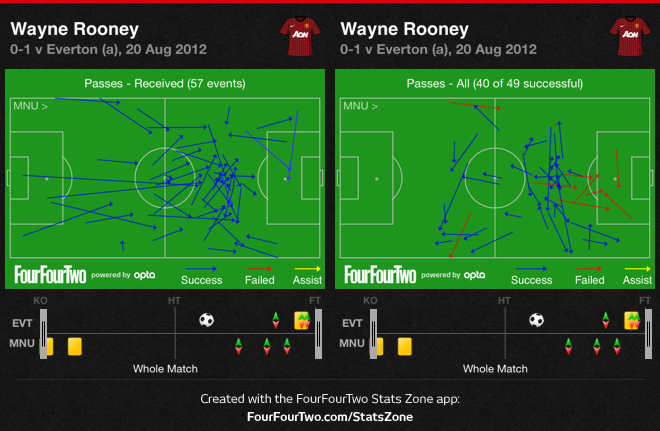 As mentionned, Rooney played poorly, showing a heavy first touch at times, and not having real influence on the game. Ideally, Carrick would have played in the middle barring any injuries, which would have United more solid defensively. Plus, with either Rio or Smalling, you would expect that United would have been able to handle Fellaini more effectively. Bearing in mind the buccaneering approach Fergie expects from the fullbacks these days, perhaps we should start to call it a 2-4-1-3. Attack,attack, attack!!! Another good read. But again no one seems to question SAF’s transfer dealing. United’s weakness in midfield was evident last season as well, but it was a poor standard of other teams in the league which couldnt exploit it. Now SAF has spent 24 mill on a striker when they already had 3 pretty good ones in Rooney, Welbeck and Hernandez, and none on a central midfielder, which they so desperately needed. Scholes surely cant play all games, especially when Utd are supposed to fight on 4 fronts. And who is to say that the other teams wont be able to exploit the MF weakness this season as well? I don’t know about ‘no one’. Everyone seems to be questioning Ferguson’s transfer dealings, in relation to central midfield for the last few seasons! What makes it cruel is Pogba had a good game the other day! He he, thats life of a football fan I guess . May be the questioning is only going on in the ManU fans’ circles, which sadly I dont follow. I was talking about the bigger experts, the pundits, the media, bloggers and such. Hardly seen any uproar about a lack of midfielder WHEN 24 mill were spent on a striker. Pogba surely was a case of attitude, rather than talent, ala Morrison? Quite a few articles/comments out there by journalists and bloggers, plenty highlighted it before/after the City game last season for example, even ZM himself for the Guardian)! Many bloggers, so-called experts, media, etc, had used the return of Scholes as a illustration of the problems in central midfield. Definitely out there quite a lot, those comments/articles but yes, more intense in United-related forums. Like with Fryers, me thinks its a case of wanting more wages, with Pogba. Apparently, wanted more time on the pitch than he got, according to recent comments by Pogba but going to a club where their central midfield (Vidal is fantastic, that is what we needed) was one of the best in football last season, I’m not having that comment! ferguson probably eyed on javi martinez but the price is crazily high, even for bayern who accepted to overpay him a lot, bilbao seem to want even more, they’re crazy because his price will never get this high again. I think they should get etienne capoue, new french international, attacks like carrick (very good short&long passer) but with a lot more of defensive impact, and just more talent in my opinion. I reckon Arsenal will go for Capoue me thinks, definitely a good shout though. How much is worth 35 million pounds if you cant spend em on other high level players? They only field basque and academy players. Athletic Bilbao asks those prices because they know they cant even dream of replacing Martinez (or Llorente, by the way). Rooney seems to me to have been overrated for quite some time. He tends not to show his best club form for England – just like Lampard and Gerrard over the years. (Is Hodgson the first England manager to get consecutive decent performances out of Gerrard?) In this year’s Euros, Rooney had a stinker. The England team against Italy the other day looked much better for his absence. But even his club form seems to be erratic – he has sustained spells of being unable to control the ball. I’ve seen other strikers lose form, but none spring to mind whose loss of form was typified by lousy ball control. It’s an odd one. I saw none of last night’s game so I look forward to seeing Kagawa. And, to quote a comments thread, “Fatman and Robin”. I can’t see how United are not going to end up with van persie and rooney upfront alone in the biggest games. Maybe this formation is the best to fit van persie, rooney, nani and kagawa but at on point you just can’t have van persie & rooney in the most decisive zone possible. You could imagine welbeck or hernandez entering between van persie & rooney and giving them a more wide passer role, but in the end i think we’ll see a big lot of classic 442 with ferguson finding a way to take the most out of kagawa on a side coming inside probably, with rooney or van persie for the wide run. Kagawa playing on the side of the more offensive fullback, probably the right side with nani providing the width with his left foot on the other side. Against the weaker teams at home, we could very well see a 4-4-2, with Carrick and Kagawa in the middle, Nani and Valencia out wide, and Rooney and RVP up top. Whilst it wouldn’t be ideal to have Kagawa that deep, his energy would allow him to track back and cover when needed, and he would see more of the ball. With Carrick beside him, he would have more license to go forward and create chances. Again, this would only really against the lesser teams, where United are dominating possesion and are camped in the opposition half. Why would Ferguson want to do that though ? The 4-2-1-3 is actually more attacking than what you outlined while providing better cover against counter attacks through the centre. The 4-4-2 would allow him to play Rooney and RVP centrally in their preferred positions ( or more of a 4-4-1-1, with Rooney behind RVP), rather than having to move one out wide. Plus, the 4-4-2- would better suit the traditional wing-play which SAF favours. As you’ve said though, the 4-2-1-3 is far more solid and would offer better protection against the counter. Therefore, this very attacking 4-4-2 would perhaps only be viable against weaker teams at home. Where does Carrick fit into this system? In the 4-2-1-3? As one of the “2″ sitting deeper and shielding the back four most likely, with either Anderson/Cleverley beside him. If Kagawa is not available, is it Rooney who will play the playmaker (the “1″) role? It will be a big travesty if United adapt to this system but don’t have anyone else to play the playmaker role bar Kagawa. Cleverly looked like someone who may be able to play that role but I think he may be being developed to play in the “2″. United in recent seasons struggled when Rooney is not available because they isn’t a natural replacement for him. United have tired Park in the Rooney role but he isn’t incisive enough and have also tried Young (in the Benfica home game) and Nani (Villa away). Whats interesting to me is that now that they have Van Persie I would have thought that a deep lying playmaker would have been more important. Say a Nuri Sahin. Go with a nominal 4-2-2-2 but with Van Persie and Rooney being very flexible about position. Both players like to drop deep to link up with the midfield and in this situation the defense wouldn’t be able to plan for which one would be doing it. SOmetimes slipping out wide to let Young or Nani step into the void in the middle. Having the flexiblity for one of the pivot players to make a run up into space. Or just putting pressure on the opposing defensive line with a deep lying playmaker. I honestly don’t know enough about Kagawa to know if that deep lying playmaker role is one he could fill but that would really seem to be a need for them at this point. Kagawa is very versatile, but I’m not sure if he would have the defensive positioning/intelligence to play as a deep lying playmaker. Added to this, it would be somewhat of a waste of his talents, as he is a good goalscorer. Plus, he seems adept at running at defences, making it more suitable for him to play further up the pitch. Definitely not a DLP at this stage of his career or in the near future. Yeah, it seems that SAF has signed Kagawa to play in an advancd central role just behind the striker(s), such as in a 4-2-1-3, or indeed a 4-2-3-1, would he would operate most effectively. His signing provides the team with more tactical versatility, as we haven’t really had a player recently who plays primarily in the hole. isnt this the same formation liverpool are trying to work? Yeah, it is pretty similar, even down to playing a striker on one wing, a winger on the other and a 9 who likes to drop deep. That said, the difference between the Allen-Lucas and Scholes-Cleverly pairings starts to reveal a pretty significant difference in emphasis. Also, unfortunately, a 32 year old Gerrard is no Kagawa, and Downing is no Nani. I’ll also just take a second to say how inadequate I find the normal number system of describing formations. a 4-4-2 could be a 4-4-1-1 or a 4-2-3-1 or a 4-2-1-3 just depending on what you call the Wingers and the CAM. I think we are at the point where describing positions this way doesn’t really add any useful information. ZM, what can you say about the two fullbacks in a 4-2-1-3 formation? The 2 wide forwards are there to stretch the play, so does that leave the fullback to just stay behind and marshall the laterals? Rooney was poor in his role, if united are going to pursist with him leading the line then he will have to re adjust to that position after playing in the hole last season. In this game he dropped into the space that Kagawa was playing in, with both getting into each others way. Welbeck also look unaccustomed to his narrow wide right role, not quite making the right movement. This could all be solved by playing the team together more, but I personally think either Welbeck or RVP leading the line with Rooney deeper and Kagawa outside would work better right now. And, yet, a very problematic formation for exactly the issues you raise. 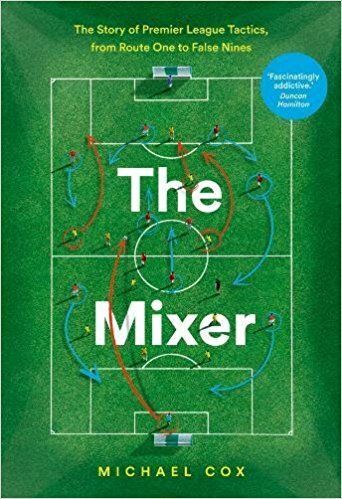 The Italians do well in accommodating the role of the “playmaker” by playing three players behind him, often one or two of which is combative, defensive-minded. As your rightly point out, neither Scholes nor Cleverly (nor even Carrick or Anderson) are that type of player. While I was impressed with Kagawa throughout last night’s contest (I’ve been a fan of him for two years now), it must be said that he’s more of a second striker than a playmaker, thus making defensive coverage even harder. Part of that was the evolving, compensatory system at Dortmund and consequently the heavy reliance the team had on him not only for creativity but for scoring…understandable and of no large fault of the player, but a problem nonetheless. Cleverley seems like a player who’s always looking to pass then move into a position where he can receive the ball back – less inclined to think about how he’s positioning himself defensively. That’s alright if he’s playing with Carrick who’s accustomed to “sitting” but Scholes is always gonna be exposed like that. Kagawa was really impressive and for Dortmund he excelled in a team whose midfield and forwards would press with great energy, with Scholes Utd cant really do that, with Anderson and Cleverley in the middle they could however as what was seen last season they both produce great entertaining football going forward but they leave their defence too open, this match showed why Carrick is important as a CM. Kagawa is going to be the key to Man Utds success particularly in Europe and his signing, along with RVP, will challenge Rooney to step-it-up and show the talent that justified many comments of him being “world-class”, which i believe he is, but i dont feel Utd have seen the best of him for a while, its a worry, first thing is first however he must gain fitness, because he didnt play that great. 442/4411 in the Prem at home or away against weaker teams with RVP and Rooney upfront will work wonders, but in Europe or against teams who are strong through the middle, Kagawa will surely play, but then who upfront? Kagawa and RVP looks to be a great partnership, but if Rooney can find the kind of “leading attack”-form he found in 09/10 it would be something to marvel at. Utd lost, but its only the first game of the season, long way to go, these small blips with new formations/personnel will turn into great gains in the future once they’ve gotten used to the system. Either way, having a problem of Rooney, RVP, Kagawa, Welbeck etc isn’t so bad, its going to be very very interesting this season. I’m curious about the designation of it as a 4-2-1-3. I didn’t see the positional locations in the game as that greatly difference from say Real Madrid’s 4-2-3-1 or Baryen’s 4-2-3-1. The forwards in each didn’t do much tracking back to support the defense, and Rooney trailed off into his inconsistent pressuring that we’ve seen in the past few seasons. In theory, the “forward” Welbeck wasn’t going to track back as much as a wide player in the 4-2-3-1, but he actually did a good deal when Everton moved down the line. He certainly wasn’t as indifferent against a team of Everton’s relative level / possession as say current Ronaldo and Robben are. On the other side, Nani can get indifferent tracking back, especially relative to Valencia on the right, but given Baines / Pienaar / Fellaini was the focus of Everton’s attack and having a non-RB at right back, Nani was forced to support. Granted, he didn’t do it very well and passed off attacked when he shouldn’t have, but again it’s not like current Ronaldo and Robben really care much in those terms. 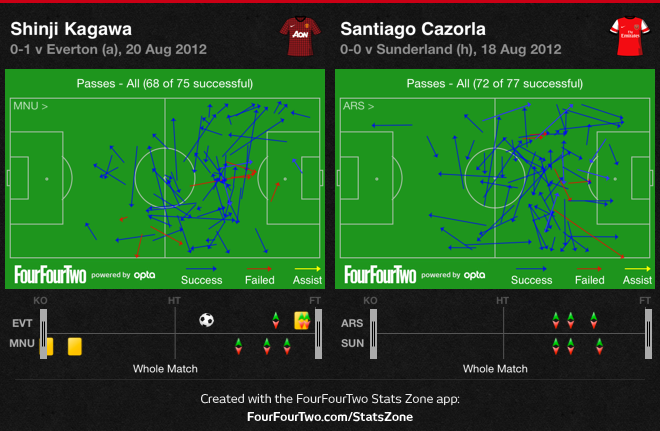 In the middle, Kagawa was very much in the Ozil spot. Just didn’t strike me as a “3″ at the top of an attacking 4, but instead a 3+1 attempt, not very well executed and lacking the interchange one would hope for in one done well. Maybe I’m off base, but I’d be interested in why you think it’s a 1+3 rather than a 3+1, other than there being forward out wide. I’ve never liked notations so I could be wrong. I guess it’s down to interpretation? Looks like a typical 4-2-3-1. And it doesn’t solve the problem how to fit in Rooney and van Persie together with Kagawa. All 3 are very similar players and will occupy the same spaces naturally. You can’t play all 3 of them without neglecting the strenghts of at least 1 of them (1 of them will have to be shifted out wide). Except you play a midfield diamond but United doesn’t have the central midfielders to do that. Thank you for any other informative web site. Where else may just I get that kind of info written in such a perfect manner? I’ve a mission that I’m simply now working on, and I’ve been at the look out for such info. Well, after Rooney’s injury today SAF has the chance to play the 4-2-3-1 with RvP upfront and Kagawa behind. Really look forward to this. Enjoy Rooney’s play but some inconsistent performances. 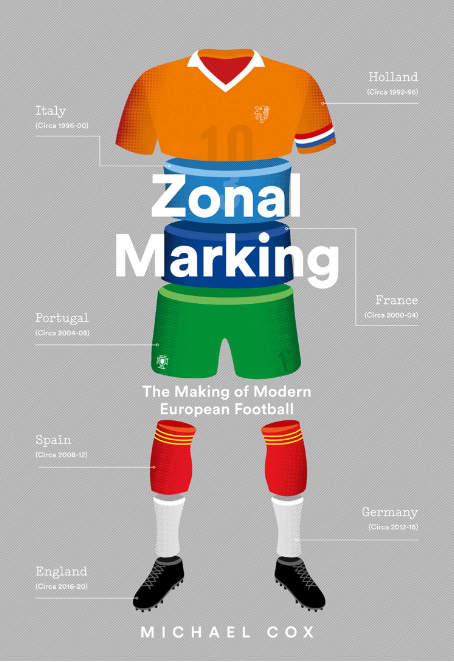 plus, europe is different than EPL of course. need to be willing to play on the counter rather than ‘playing our way’ and losing. respect SAF but I want to stick it to barca, et al. I dont speak on many sites that I come across but I felt I couldn’t pass up the opportunity with this one. Super post. I can only imagine what you will be posting in the future. Custom made trademarks are near all times popular and people all in the http://www.cheapguccistock.com/chanel-tote.html world attempt to acquire one item they are hoping to see. They may be thought of any position icon and they often regarding wealthy and high community people today. We have been http://www.cheapguccistock.com/gucci-messenger-bags.html competent to certainly not have too a lot of purses and handbags, its function is to complement the basic looks and go with our clothes as well as tennis shoes and we’ll want a number of for situations as well as special events. It truly is every lady’s fantasy to put on custom made garments along with transport http://www.cheapguccistock.com custom bags. Most of these would arranged all of them apart from other individuals and offer all of them the attention they are looking for. A minimum of one time in your existence we now have viewed ladies having any Valentino nights costume and also having Prada Electric outlet purses along with going for walks with centers. As a result people jealous as well as wishing there were a kind of also. Mate! this blog site is awesome! How do you make it look this useful.